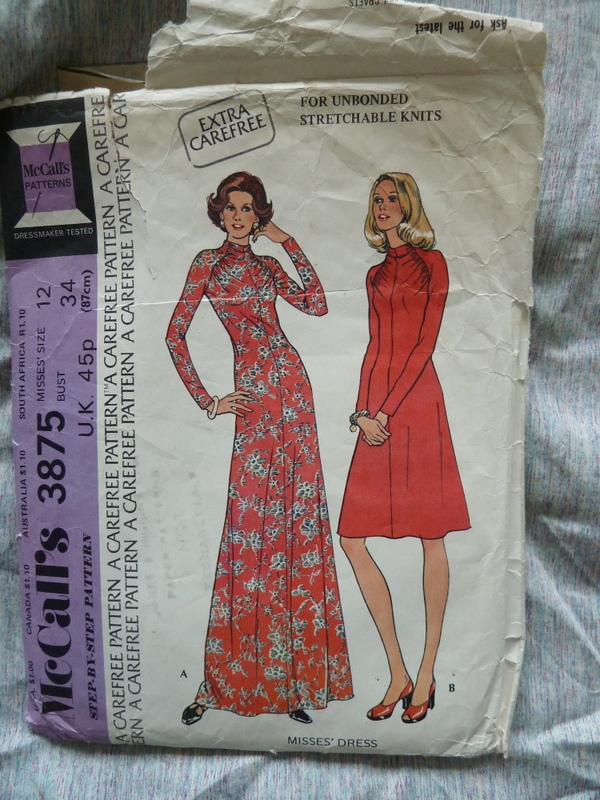 Posted on February 15, 2014 August 5, 2014 by catherinedaze	This entry was posted in Fabric, Finished, McCall's, sewing, Vintage and tagged 1970s, dressmaking, mcalls, sewing, vintage. Bookmark the permalink. I have to admit – I like the front draping. Regarding pockets – did you cut the pocket bags together with the front and back or sew in separately later? These are cut separately which is why moving them was such a pain because I had more unpicking. I guess it would reduce bulk to cut them together? Have to give that a go, thanks! Great dress. I remember this one from the 1970s, although I never made it up. This is a truly timeless design and it looks wonderful on you. Have you considered topstitching the pocket bags in place? I would hand baste them in position and see if it would help before going to the machine with it. Just a thought. It is a shame that you had problems with the pockets. I also require pockets. It is very cumbersome to be without them. I love the gathering at the front. It is very subtle, but creates a strong effect. My suggestion is to cut the pockets in one with the front and back pieces. Sew the side and pocket seam in one continous seam and apply fusible interfacing or vilene tape where they will be turned back for stability. Then topstitch the pocket edges or tack them down from the inside. Now I have to go search for this pattern on Etsy! My only idea regarding pockets would be to increase the front seam allowance at pocket area only to say 1″. Have a pocket bag piece only on the back piece. Finish the front pocket opening as appropriate for your fabric and topstitch the pocket bag to the front of the dress. You’d only have one pocket layer and it’s topstitched in place. You could bartack the pocket opening to make the opening more polished or secure. It would be like an internal, kind of sneaky patch pocket. Of course the success of this idea would be dependent upon your fabric and finding the right stabilization. I’m sure you’ll hit upon an idea that works! Nice dress! I like it in the dark jersey. that draping is so subtle but so sharp, this is a winner! that is a very cool dress, looks great on you. I have to admit my first thought was “cycling in a dress?”. But hey I live in the U, land of big cars, lots of roads and overweight people. I can see how the flare skirt would let you cycle with ease, and I love the gathering at the raglan seam. Very unique. This is so pretty, love the neckline and bodice. I was thinking like redsilvia above, back bag only, for the pocket. You could try it on some scraps, see how it works. Hems on jersey sure can get wimpy. Sometimes does help to put in a deeper hem with interfacing. 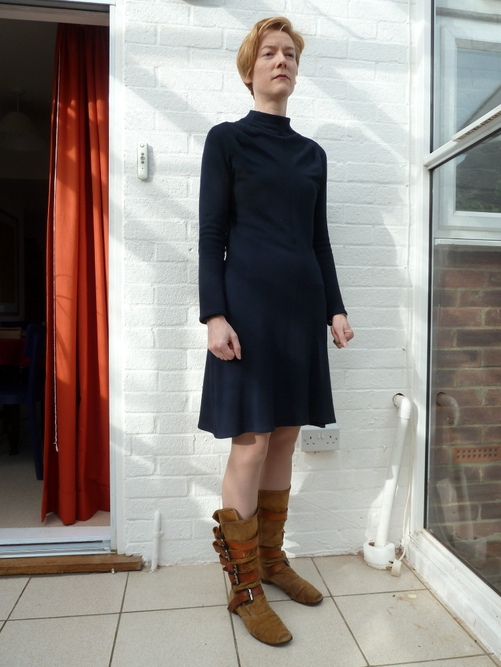 But in the end – really like this dress on you! I agree with everyone a single piece pocket possibly out of a thinner jersey would help with bulk. This is a chic little number though. Pretty cool!